So, with THE HOLVER ALLEY CREW just a few weeks away, now's the time when I've really got to put a tight rein on my own bad habits. That bad habit is become obsessed with the other books that are coming out around now and how much attention is apparently being paid to them. Key word there: apparently. Because I have learned that sometimes due to the circles I pay attention to, an upcoming book can seem to be The Thing Everyone Is Talking About, but in fact, it's really not being talked about much outside of those circles. I still feel that swell of jealousy. It's natural, it's human, and I try not to make too much of a thing. But there are so many ways to drive yourself crazy with this. So here's an example. Any given month, there's going to be a few articles here in and there (where they talk about SFF books) about the books that are coming out that month. There are the ones that just list ALL THE BOOKS, which is about 200ish per month. And that's JUST the professionally, traditionally published ones. That's just a list, though, so in many ways, it's little more than noise. No one will notice your book on that list who wasn't already looking for it. Helpful for completists, but little more. But then there are the curated lists, of about ten to twelve books coming out that month. Ten to twelve of those 200ish books. Any given month, there will be about three titles that will be on ALL THE LISTS. No matter what. The big dogs of the genre. Then there will be about ten more which will take up five to seven slots on those lists. If you've done your math, you can tell that can be the whole list, most of the time. Those are the essentially, "These are the books everyone's talking about this month." And then there's a couple wild card slots. Right now, that's my zone-- getting named on a wild card. This makes getting on any of those curated lists a pleasant surprise. But it also means I pay attention to a lot of those things in any given month I have a release. So I notice what those essential books are, and oh, does it start to burn. But I keep it in check. In part, because I know I'm doing all right. And also because I like having something to strive for. The good thing about still being a wild card is it keeps my ego in check. Sometimes, I think that's more important. 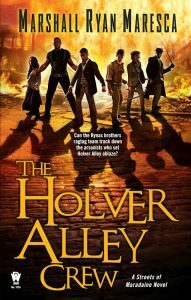 Hey, let's not forget that there's still a few weeks to pre-order THE HOLVER ALLEY CREW. You're going to want to get your hands on this one as soon as you can. The Rynax brothers had gone legit after Asti Rynax's service in Druth Intelligence had shattered his nerves, and marriage and fatherhood convinced Verci Rynax to leave his life of thievery. They settled back in their old neighborhood in West Maradaine and bought themselves a shop, eager for a simple, honest life. Then the Holver Alley Fire incinerated their plans. With no home, no shop, and no honest income—and saddled with a looming debt—they fall back on their old skills and old friends. With a crew of other fire victims, Asti and Verci plan a simple carriage heist, but the job spirals out of control as they learn that the fire was no accident. 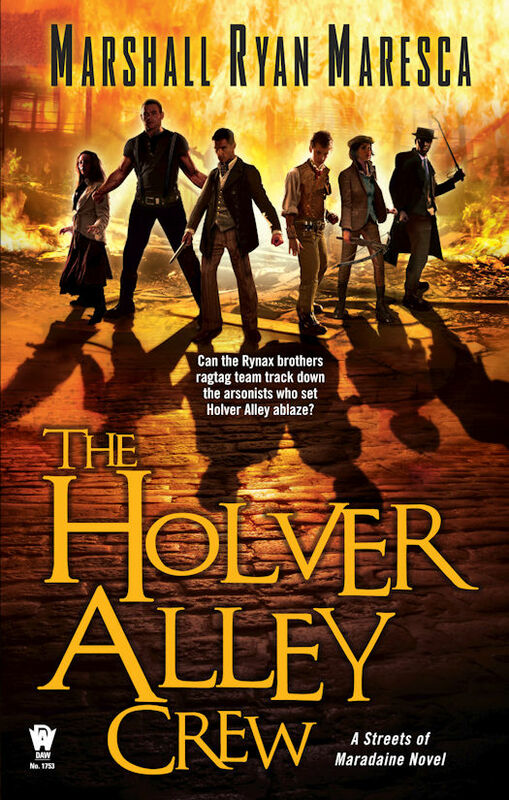 Lives in Holver Alley were destroyed out of a sadistic scheme to buy the land. Smoldering for revenge, burdened with Asti's crumbling sanity, the brothers lead their crew of amateurs and washouts to take down those responsible for the fire, no matter the cost.